The Content Wrangler is a San Francisco-based global digital media company that exists to help organizations adopt the tools, technologies, and techniques they need to connect content to customers. A small shop with two employees, The Content Wrangler uses webinars to build awareness, develop interest, and spot right-fit prospects. To compete with much larger firms, the company leverages its content strategy know-how to produce nearly 100 webinars a year on BrightTALK. Producing that many programs may seem unrealistic for even a much larger team, but it’s possible because the company applies principles from lean manufacturing to their webinar production processes -- a format that any company can replicate. 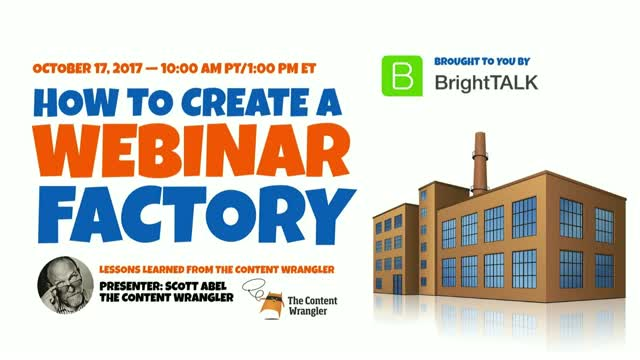 Join BrightTALK for a special presentation from Scott Abel, Chief Wrangler at The Content Wrangler. You’ll learn how The Content Wrangler built one of the fastest growing—and most engaged—channels on brighttalk.com. You’ll discover how adapting lessons learned from single-source publishing can be applied to your webinar production process, enabling you to produce more webinars with less effort.